When we started Evolve in 2000 we did it with the clear intent that we wanted to be something magical. We created a business based on insights on people and learning that we thought would make a significant difference. We believed we could figure out how operational consulting programs could be positive and add an enormous amount of value and growth for all involved. We wanted to stand out and be genuinely different, we wanted to attract skilled practitioners who shared our mindset and wanted to be part of growing something special. But in order to stand out we wanted to stand for something. WE WANTED TO ENABLE PEOPLE TO MAKE WHAT THEY BELIEVED WAS IMPOSSIBLE, POSSIBLE. This refresh replaces the 2006 version, and although much remains the same our evolution means that we can create a simpler and more concise version. The Blueprint is intended to inspire creativity within us all. It is meant to encourage us to develop continually what we know, what we do and who we are, by allowing the talented people we are, to align easily and leverage our efforts with those of the rest of the team and our bigger “Idea”. We believe that the Evolve Blueprint will be an invaluable resource to continue to build the Evolve we want to be. It will also help all of us think through what we do each day to make better interventions with our clients and one another. Simply put, if we know what it is we aspire to be, and why, and what we need to do to accomplish it, we can spend all of our time trying to be it, rather than wondering what it is. THE WHY OF EVOLVE – WHY ARE WE DIFFERENT? Learning how to deliver superior results faster by motivating people and growing their capability is a key source of shareholder value and competitive advantage for our clients. It is the “magic” that enables all successful organizations to maximize the return on their strategy, assets and investments. Evolve exists to enable people to make the impossible possible—to find meaning and excitement in achieving performance that once seemed beyond imagination. 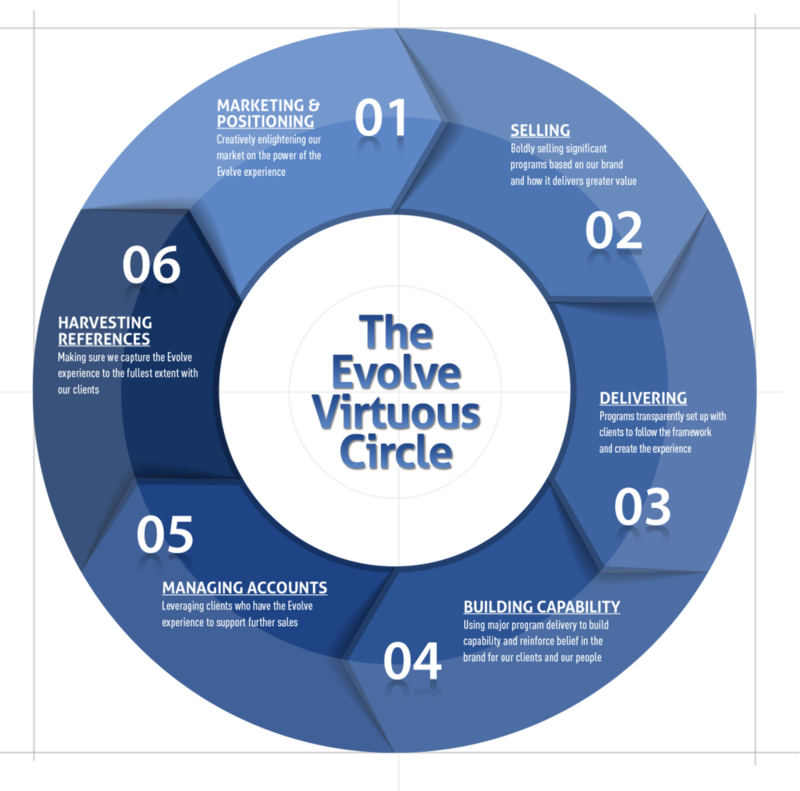 At Evolve everything we do is designed to deliver superior results by maximizing the engagement and learning of an organization. Working with Evolve is a strategic choice that drives performance and can yield enormous benefits in the near term and into the future. Evolve is like no other consultancy, as it was purpose-built to deliver on this exciting promise. We recognized that when consultantstry to come up with the “solutions”, as is normally the case, they reinforce the real problem by taking away the opportunity for the client’s people to learn and grow. It’s like going to the gym with your personal trainer and watching him work out! The way we work creates experiences for our clients so that they can begin to see what the solutions will look like, but they are guided and supported by us along the way. Working in this way means having a style, Framework and structures that are consistent with this intent and are often very different from our competitors. Our Idea is that change programs only really work if they create the circumstances where enough clients develop new skills to drive higher performance and that a well set up change program can create the ideal circumstances for doing this if approached in the right way. When you use the opportunity provided by a performance improvement program in this way something magical happens. You get improved processes and systems, as well as improved results. But you get something much more important: more motivated, capable and connected people who will continue to drive performance into the future because they’ve truly learned something and discovered meaning in success and growth. It might be easy to imagine how people in an organization leap out of bed everyday saying, “I’m going to add extra value to the shareholders of the company who I don’t know and have never met because it’s just the right thing to do.” But of course the reality is that most people need something much closer to them personally to create motivation and excitement. Evolve achieves this by engaging people and opening them up to new learning into the future by connecting experiences to challenges that are at the forefront of their minds day to day. Not surprisingly we have a long track record with many of the industry’s best companies because our approach adds more value in the short term and far more value in the long term—and they recognize that. The outcome is that we have worked in many aspects of the value chain of many of the clients we serve. The key to this success is what we leave behind. First, substantial shifts in key results such as production volumes, reliability, safety, capital expenditure and operating costs. These shifts are evident in a way that is not just sustainable but where the variation in performance often becomes less and the improvement continues well into the future. As an example, we helped one client deliver a 20% improvement in production, valued at approximately $400MM per annum, with no additional capital expenditure. This outcome was particularly impressive as the company we worked with was already widely considered to be the benchmark in that segment of the industry. We also help clients implement more consistent and improved operating processes, and management systems and the capability not only to own and use the systems and processes effectively, but also to improve upon them in the future. The type of change we effect in clients requires that ultimately we work on practical things. This is why we have an Operational Excellence model that includes an understanding of elements such as production monitoring optimization, maintenance and projects. Clients cannot achieve a different level of performance unless you actually work on these specific things. Lastly—and this is where the magic lies—we change the behaviors and beliefs of the people who work in the business. They learn to use the systems and processes to drive results that they previously didn’t think possible. This means adopting a more effective leadership style that is often more inclusive, more proactive and which drives value from the new systems and processes, through better and faster decisions and interventions. Ultimately, we coach people to become the best they can be, for themselves. The combination of these three elements means that what we ultimately do for clients is create substantial leverage, in a far quicker and more consistent manner. We will hold ourselves to the highest standards of delivery for our clients, recognizing that everything we do is designed to deliver superior results by maximizing the engagement and learning of an organization. We will create a business to make our Idea a reality on a significant scale. We believe our Idea is significant but can only be of any actual value when it is used to make interventions, which result in better outcomes at a scale. We will make sufficient profits to fuel us on our journey to may make our Vision a reality. Making healthy profits is essential for us, as we seek to grow by attracting and motivating the best people and by investing in development of our knowledge, skills, infrastructure and culture. We have developed a model that talks to the key things we need to do to succeed. We have recognized that, in our unique model of consulting, missing doing any one step consistently well destroys substantial value for us in the long term. We have learned that we have to do it all consistently well and find ways of measuring and constantly challenging ourselves to find innovative ways of doing it better. By doing that we will create substantial value for our clients and us. We believe the most important thing is to grow slower and do something that is high quality and meaningful. 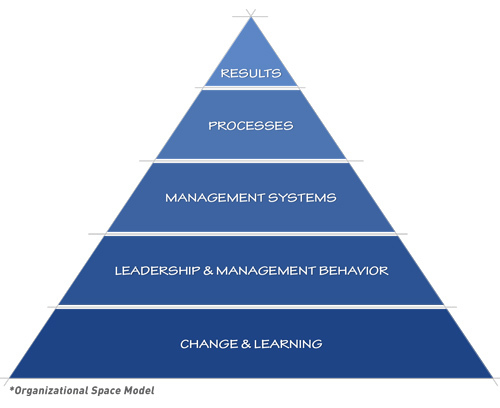 Evolve’s “Art of Implementation” begins with our fundamental change model – the Organizational Space Model*. 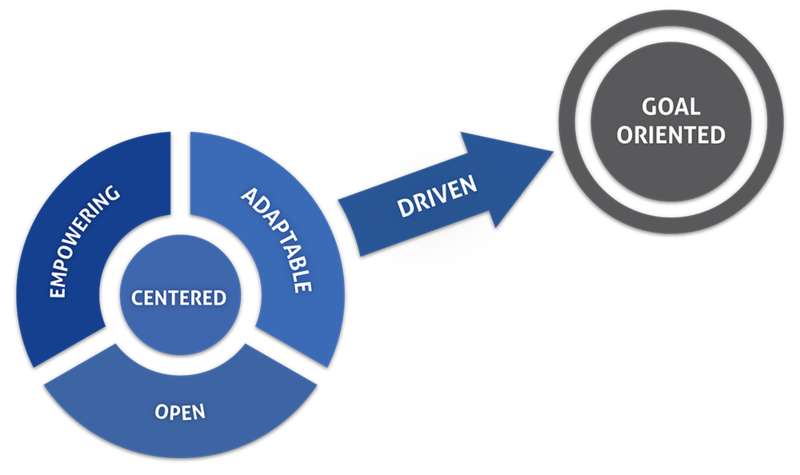 This model speaks to how organizations drive performance, and how we enable our clients’ people to work at their best. We work through our clients’ people to deliver operational results by designing and implementing improved processes such as planning and forecasting, production optimization and project execution. We help them reduce the waste, variation and complexity. We don’t bring all the answers. We bring best practices as a starting point to help them develop their own unique way, thus ensuring their feeling of ownership. We help our clients develop improved management systems to drive performance more effectively, the meetings, the KPIs and the decisions made. We then educate and coach our clients to make better interventions that move the implementation beyond compliance. This “in situ” style of learning creates relevance and meaning for the people we work with and hence the drive to want to learn new skills. This, connecting the different parts of the Organizational Space model through our clients in the context of the real challenges they face, is the essence of how we are different. It’s our belief that the reason why most implementation efforts ultimately fail to deliver as much value as they could is because they fail to develop sufficient skills in enough people to drive performance forward. Learning new skills, as opposed to new knowledge is difficult for mature adults and requires certain conditions for success. One of these is the need, or “pull” to achieve more in the context of the real challenges faced on a day-by-day basis. This is why a well-structured change program is an ideal environment to work on skills. But first people have to recognize, be engaged in and own the challenges and feel comfortable trying new things. This last point is particularly tricky because the exposure and fear associated with potentially failing in front of our seniors and peers when practicing something new is very real and something we feel and observe every day. There are however a number of strategies that can help our clients cross this Rubicon. Our methodology of how we work in a program to deliver the benefits is of course our Framework. It’s based on what we know works from our experience of 100’s of programs and in particular on what engages people and helps them learn. In order for it to be our clients program, we have to use the same roadmap and language throughout. Without this, our programs turn into the usual “magical mystery tour”. It’s very hard for our clients to own the journey and drive it forward when you don’t know where you’re going! As we say “you don’t wash the rental car!” because you don’t look after things you don’t feel are yours. First, the key driver in any change is the “V D KS”—increasing the vision for the future, dissatisfaction with the status quo and knowledge of steps needed to deliver the change. Helping clients get excited by powerful visions of success and helping them realize how they would personally win develops their personal connection to the vision. This emotional connection is key, as people need to be genuinely motivated by personal wins to make the change journey worth taking in the first place. Coupled with this is creating the opportunity for a critical mass of clients to see for themselves how far current reality is away from the vision. This cannot be achieved by being told—clients must experience this for themselves by looking at their business from a different viewpoint or analyzing data in a different way to create a new, deeper realization and the personal emotion of dissatisfaction. Furthermore, clients must understand the pathway—the knowledge of steps of how we are going to effect the change—and believe that it is possible. The “destabilization” and its associated “we’re not quite as good as we thought we were” is the first step in the supplantive learning journey. Supplantive learning is transformational and involves working in a completely different way to achieve a step change in performance (think bike riding vs. walking). Of course this “realization” has to be experienced personally to have this impact. There is no such thing as organizational realization, as each person feels it separately. We can’t, as it were, realize things for people by just presenting information. It has to be experienced individually. It’s important that this analysis is done in such a way that it gives insights into the steps and outcomes that will be required to close the gaps, thereby creating belief that the change might succeed. The trick is to help the client hold this tension and revisit it throughout the program using management systems, supported by facilitation and coaching as a mechanism to manage it. When effected on a scale, this maintenance of tension is the fundamental driver of personal, and hence organizational, change and is the antidote of the natural tendency to drift back into comfort. The “disorientation” driven by this tension creates the desire to resolve the conflict and find and learn new skills. The longer we maintain this tension, hence maintaining the opportunity to practice new skills, the more we help clients feel comfortable and confident feeling uncomfortable—and thus more open to new learning experiences and further significant improvements in performance in the future. This is a good example of some of the changes we effect that can only be truly understood from experience. The second point concerns education and coaching. We educate our clients around core models and tools on a “just in time basis” to increase their options for timely intervention. Just in time is important because people need to apply ideas quickly if the ideas are to be retained and translated to skill. An example of this could be helping a leader be more challenging with his people by showing him the Challenge and Support model to show how he might choose a different intervention to drive performance. We don’t tell our clients what to do, we support them by increasing the options available and encourage them to try new things and then give them feedback. Some of these models, particularly around change and learning can be counter intuitive. For example “promoting the change” at the bottom of the Cliff Face is a far better option than asking people if they want to do it! Third, although what we ultimately sell is a superior change process, we also bring a wealth of best practice and knowledge of industry content to the challenges our client face in the industries we serve. A way of thinking about this is you wouldn’t trust a great piano teacher to teach you the guitar. The change and learning process is important, but so is content as it gives clients a picture of what good looks like and the confidence to try new things since we can relate how it worked in a similar situation. This confidence is important, as being successful and appreciated with the first new interventions clients make in a program is a great antidote to fear. Finally however you look at it, developing new skills takes a substantial amount of time, so it’s critical that we get our clients trying new things as early as possible. That doesn’t mean we never do things for clients, but the faster we can get teams working on challenges for themselves with our support, the more opportunity they will have for practice. Teams are important in our process as is one unified program for they both take away the “me vs. the world” feelings and create a sense of unity that we’re all learning together. This is a further antidote to the fear of stepping out of our comfort zones. This point that skills take time to develop through practice is particularly true of leading change, which is what we do for both our clients, and ourselves. Since the process usually takes one to two years at a minimum, it’s not surprising that very few have sufficient experience to have any real mastery of it. Although the Five Keys model is a huge simplification of the complexity of implementation, it can serve as a great aid memoir for what might be missing when we’re struggling to make progress with a client and provide us with ideas on what interventions might be missing. Lastly in our quest to “get it done”, it’s easy to forget the importance of reflecting, reorienting and communicating and celebrating success. We should do this in a cyclical way throughout the program as a powerful reinforcement of learning that drives sustainability. After all as we’re climbing the mountain it’s real important to stop and see how much the view has improved and how far you’ve come. Being a great leader in Evolve means leaving behind your normal desires to achieve safety and comfort. It means creating a passion about the future we desire, finding your authentic voice, embracing a willingness to sacrifice for the greater good and joining the dance of exploration and creation. It means being comfortable being uncomfortable in order to pursue and create the future we desire. It is not a normal state, but we can access it if we practice and choose it. The following are the attributes we believe we all need to be great leaders. It isn’t possible to prescribe how people should behave on a daily basis. Just saying how we think we should behave won’t make it so. But being Our Idea should mean that we behave in ways that are designed to get the best out of each other and ourselves. We have defined a series of principles* that we believe we should understand, make the connection to what we do, and challenge ourselves and each other, to live by every day. We believe that individuals are the source of who they are, how they feel, behave and perform. We can choose to be a player and not a victim and can lead with head and heart. We recognize that we can choose to be inspiring, self-motivating and determined. We take on accountabilities out of creative cause, not for praise or credit, or out of burden, blame or guilt. We seek out perspective because we don’t believe in “right” answers, just better interventions. This requires us to be thoughtful, self-aware, humble and low ego. But we are not afraid to have a point of view on what we believe can work better. We believe in people. We are supportive, and show empathy and compassion to see the potential in everyone. We understand the importance of meaning at a personal level, and how active appreciation can counteract fear. We believe that trust is fundamental to success in our business, which means we must be transparent, reliable, accepting and congruent. We must do what we’ve said we’ll do, we must be clear in our expectations and opinions, be accepting of mistakes and limitations of others, and “walk our talk”. We must also be sincere, hear and acknowledge others, be candid and straight, and demonstrate integrity and clarity with boundaries. We are externally curious and understand the value of seeing and acting beyond ourselves. We value the thoughts and suggestions of others and invite them into our conversations. We actively encourage collaboration and interdependency. We are aware of our interactions with the world and the opportunity to learn from our successes and failures. We are comfortable with ambiguity and use an enabling leadership style that allows people to experiment and learn. We don’t take ourselves too seriously. We believe upsets are setups for learning. We judge performance by what is achieved, but in the meantime we assume positive intent. We believe in courage and energy, look for the positive and are future focused. We recognize that performance is situational and some achievements need to be judged over longer time periods. We set high standards, welcome challenge and are honest and transparent about our own performance. We believe we engage with the whole of a person, not just their work persona, and are sensitive to cultural diversity. We encourage health and life balance. We believe businesses should do good when they are doing great. In conclusion the Blueprint is our North Star. We may never reach it, but we can use it to constantly remind ourselves where we’re going and to plot our course by it. To do that, we must look at all aspects of it regularly and discuss where we are, in our teams, to drive the creative tension.